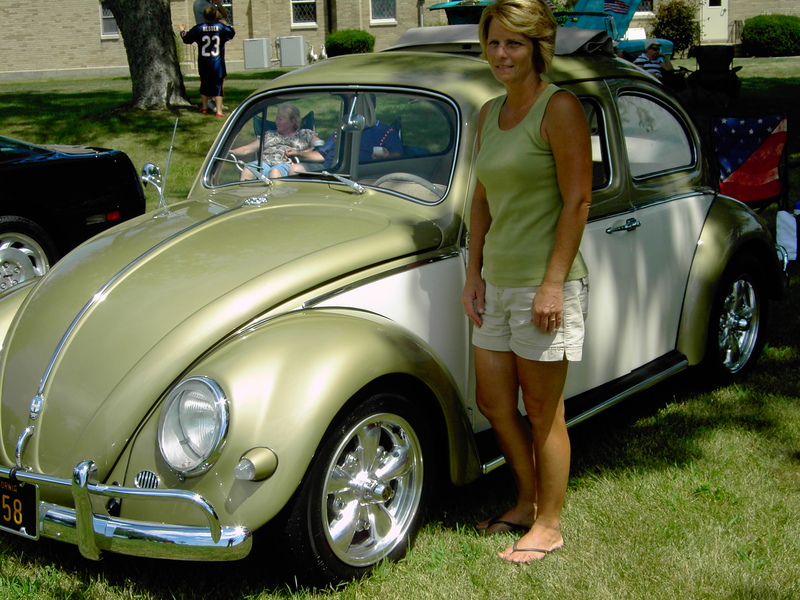 Kathy Mohler of Bluffton, Indiana, likes Beetles. Specifically, she likes anything made by the Volkswagen Company 1957-1961. One experience Mohler recalls was when the three of them built a dune buggy in the 1970s. “We built it from metal scraps and I learned about everything, including the welding and building the engine,” she said. When Mohler married and began a family, she never forgot her interest in classic cars. In 2009 she researched the Internet to find an older VW. “I liked the style with all metal,” she said. Mohler found what she wanted in the state of Montana. It was advertised as a 1958 green and cream Diamond VW bug. She purchased it sight unseen. Mohler liked several things about the car. “It had tweed, tan-colored interior material,” she said. “I also liked the exterior paint.” She wanted a VW with a rag top that folded back like a Roman shade. “They were only made certain years,” she said, adding it might have been the late 1950s and early 1960s. The car did have an oil leak, but that was no problem for Mohler and her brother. They replaced the engine with a bigger one, fixed the transmission leak and installed a new clutch. Today, Mohler estimates she gets 30 miles per gallon. She also added chrome to the car’s exterior and a bamboo rack on which to hang her purse under the dash. Everything else in the car is original. As is true with most VW’s, the car’s engine is in the trunk and the front functions as a trunk. The car has no air conditioning, seat belts, heater or radiator. “Heaters were options then,” she said. “I’ll probably put in lap belts.” Mohler also added a gas gauge. Mohler has had the car inspected by local law enforcement officials to obtain a historical plate. The harsh Indiana winters can prove costly on any car so Mohler parks the VW during the cold months. Otherwise it serves as her daily drive to work. Mohler estimates she drives it 1,200 miles per year. The 1958 VW was her first classic car to own. Mohler has entered the VW in classic car shows and competitions, such as the Bluffton Free Street Fair Classic Car Parade where she won Ladies Choice in 2009. She has also participated in Fort Wayne’s Muddy River Run and the cruise-in’s at Arnold’s Drive-in in Decatur, Indiana. The furthest she has driven the car was to the Plymouth (Indiana) Blueberry Festival. Mohler likes the fact that her car is a head-turner. “People give me a thumbs-up sign all of the time,” she said. At home Mohler still changes the oil in both of her cars. Some things never change.